John Edgecombe of Tirley (Balliol 1670) made his Will in 1704: it was proved in the PCC in 1706. In it, after the expiry of several family interests, he left the College his ”Estate of Cumberwood (alias Cumberworth) bought of Mr Phelps………for the Maintainance of Three Scholars which shall come from the free Schoole of Hanley”. He had in fact made arrangements in his lifetime, to which he added detail in his Will. There is no copy of the Will in Balliol; to understand much of what took place ca 1699-1730 it is necessary to consult the NTA copy. The estate was located between the adjacent villages of Tirley and Chaceley,which were then in Gloucestershire and Worcestershire respectively: both Parishes are now in Gloucestershire as redefined . It was known as Little Cumberwood Farm:its farmhouse was said to be derelict in 1964 .There is no “Little Cumberwood Farm” now but the Great Cumberwood Farm to which it was adjacent does still exist at SO8429 (GL19 4HQ). Like almost all Closed Exhibitions, the Edgecombe Exhibition was abolished by mid-19th century reforms, and the endowment was absorbed for general educational purposes by the College, which sold the Farm to the sitting tenant Tom N Hopkins shortly after a general review of its estates in 1919. Title deeds and other documentation from 1391 were acquired with the property and survive in the College Archives along with the College’s own administrative material down to the early 20th century. Some of this was briefly listed by George Parker in the late 19th century as part of the Formal Archives at F.2 and F.4. He also listed isolated documents at F.11 13a, F.11.13b, F.11.14 and F.12.3, F.12.4. Two small files of modern papers were rescued about 1980 from the former Bursary cellar on Staircase III and noted as MBP 116 and MBP 141. In 2015 this scattered material was brought together and renumbered in F.3, which had been left entirely void by Parker, and the whole of F.2-F.4, comprising now all of the documents in the College Archives concerning the Edgcombe Exhibition Estate (Little Cumberwood Farm) was described afresh and in detail as below.It is an estate archive only and contains no information about the Edgcombe Exhibitioners. The VCH article on Tirley mentions in passing information provided by the Domestic Bursar of Balliol, but only cites one item, F.2.23. There is no reference to Balliol or anything in the Balliol Archives in the VCH Chaceley article. F.2.1a. Richard Nikard of Broumsgrove to Richard Penebrugge de la Reye, grant of half an acre of meadow in Elynge meadow near Deruste, dated from Trynley 1391. Faded and soiled. One seal tag with intact seal. Principal motif a stags head full on; rim inscription not deciphered. F.2.1b. James atte Sandput to John Wyn, John P… and John B….. grant of lands in Chaddesley and Trynley 1415.One seal tag ,seal largely lost. F.2.2. John Wyn, John P…. 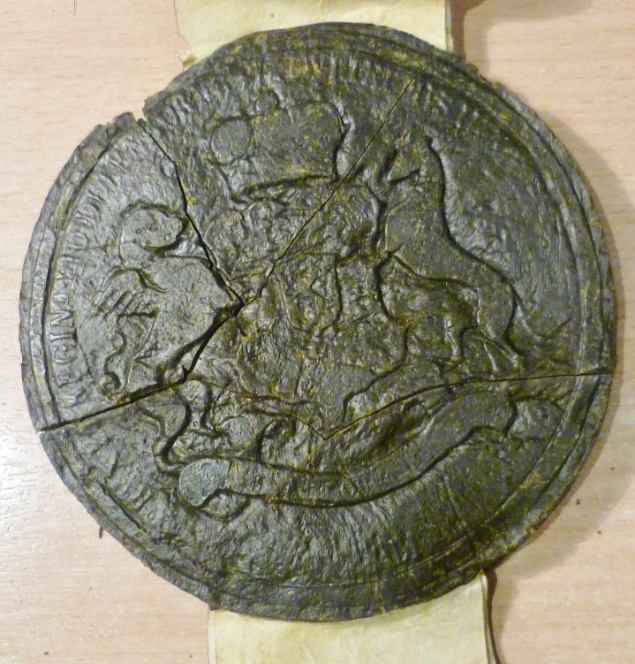 and John B…… to Thomas Roggers of Trynley, grant of the same lands, 1421.Three seal tags : one intact seal (illustrated below), one damaged but showing a W as the motif, and one seal missing. F.2.4. William Dawfey and John White to William son of Thomas Roggers of Trynley, grant of same lands 1 September 1446.Two seal tags with seals, designs indistinct. F.2.5. Agnes Wye to William Roggers, grant of lands in Chaddesley and Trylley ,22 January 1473/4.One seal tag with an intact seal,but rubbed and indistinct. F.2.6. and F.2.7a. William Roggers of Twynnyng to William Holdere of Wyghtefelde, grant of lands in Chaddesley and Trylley 23 May 1474. One seal tag with intact seal rubbed and indistinct in each case. F.2.7b. William Roggers of Twynnyng, Power of Attorney for the above transaction, to Thomas Sequens of Tewkesbury 23 May 1474. One seal tag with intact seal rubbed and indistinct. F.2.7c.and F.2.7d. Thomas Holdere alias Tyncker of Derehurste in the County of Gloucestershire, to William Cockes of Norton Castell in the County of Worcestershire, grant of land in Chatysley, 10 June 1516. Both deeds have one seal tag with a small intact but very rubbed seal. F.2.7e. Margaret or Margey Holdere, relict of Thomas Holdere to her son, grant of land (unclear ),draft: nd, never had a seal tag. F.2.8a. William Cockes of Norton Castell in the County of Worcestershire to William Holder, release of lands in Chattysley and Tyrley 6 October 1533. F.2.8b-c. Documents of 1637-8 whereby John Bishop late of Chattesley alias Chaseley, Yeoman, sold to Samuel Bave, Doctor of Medicine in the City of Gloucester, two messuages and certain lands in Tirley and Chaceley.One messuage was called Sandpitts, the other Stephens Haye. F.2.9a. Henry Franckombe of the City of Gloucester Draper, son and heir of William Franckombe late of Tirley alias Trinley, Yeoman, deceased to Richard Colchester Esq. of Grays Inn, 25 July 1634. Conveyance of messuage etc called Cumberworthes Farm in Tirley alias Trinley; with Keckhills Crofts, Sandpitts Close etc ,23 rudges of arable land in Millfield, and 18 rudges of arable land in Ladie field, all in Chatesley alias Chaseley; and a dole of meadowe in a meadowe called Horkney,and a close called Pypers Lynes, both in Tirley alias Trinley. All of which property formerly belonged to “John Franckombe deceased granndfather of the said Henry Francombe” , and was “in the several occupations of Joane Francombe widdowe Granndmother of the said Henry Franckcome and of Richard Colchester by right of his wife Elizabeth the mother of the said Henry Francombe their assignee or assignes or undertenants”. Consideration £550.Signed and sealed by Henry Franckombe, seal on a tag intact. Endorsed by witnesses signing Gerard Prior, John Gwilliam, Nathaniell B…, John Edwardes, John Wodward and Steph: Halford. F.2.9b. A Court document concerning the transaction below, dated 28 November 1634.Sealed with a large armorial seal in black wax broken into many fragments. F.2.9c. Conveyance of the property described in F.2.9a, 15 October 1634. Richard Colchester the Elder, Gentleman, Richard Colchester Esq. the Younger of Grays Inn his son and Elizabeth wife of the former to Samuel Bave of the City of Gloucester, Doctor in Physick. Consideration £540. Anthony Robinson Esq and William Bell Gentleman were appointed attorneys in the matter .The two Richard Colchesters both signed their names and appended their seals, which are intact on separate tags; (a), a shield showing a chevron between three six-point mullets, surrounded by frippery with an indistinct crest, probably a round helm; and (b), presumably that of Richard Colchester the Younger, a bold RC. Elizabeth Colchester made her mark E and appended a seal which is intact, probably showing a lion passant. Endorsed three times. Execution by Richard Colchester the Elder and Elizabeth his wife was witnessed by Wm:Bell, Robt :Backhouse, Wm Wrench (all signing) and Robert Shewell and John Little ( who made their marks). Execution by Richard Colchester Esq. was witnessed by Wm: Bell, Rich: Pope, John Wodward and Robt: Backhouse( all signing). Completion by William Bell on 2 January 1634/5 was witnessed by Robt: Backhouse (signing), and Richard Jones and Giles Hawker (making their marks). F.2.10a. Conveyance of the property described in F.2.9a and F.2.9c, and the property in F.2.8b-c, 10 September 1653. Samuel Bave late of the City of Gloucester Doctor of Physick but now of the Town of Bath to Samuel Phelpes of the City of London, Marchant. Consideration £1300.Signed by Samuel Bave who appended a large lump of red wax to the seal tag without making an impression. F.2.10b and F.2.10c. Duplicated copies of an agreement before the Court concerning the above transaction, “from the day of St Hillary in fifteen days”…1653. F.2.11. Void number in the 19th century list. F.2.12. Contemporary copy, uncertified, of the Will of Samuel Phelps of the Parish of Basingshaw, London, Merchant, made 14 October 1672 (it was proved in the PCC 1673) bequeathing Cumberwood and Sandpitts to his wife Anne Phelps for he rlife, afterwards to his son Samuel Phelps. F.2.13. Indenture Bipartite, 31 December 1679, between: (a), Samuel Phelps of London, Merchant, son and heir of Samuel Phelps the Elder late of London, also Merchant, deceased, Anne Phelps widow, relict of Samuel Phelps the father, and Anne Phelps Spinster, daughter of Samuel Phelps the Elder and the said Anne Phelps his wife; and (b), Arthur Gaell Citizen and Haberdasher of London, Edward Gaell of Ipswich Linen Draper, Francis Boynton of London, Merchant, and Ralph Ingram of London Linen Draper. All parties signed their names and appended symbolic but essentially featureless seals. Apparently a Mortgage of the property in F.2.10a and previous documents for £500, but probably part of a complex Marriage Settlement, as a licence for the Marriage of Arthur Gaell and Anne Phlps the Younger was issued on 1 January 1679/8. F.2.14. Memorandum that the £500 mentioned in F.2.13, and also in a connected Indenture Tripartite dated 28 November 1679 which does not survive, has been repaid and unencumbered title to the property has been restored to Samuel Phelps. Signed and sealed by Edward Gael (small armorial seal: three charges, perhaps animal heads, on a fess between three saltires), Francis Boynton (armorial seal: a small crescent on a fess between three crescents), Ralph Ingram (seal indistinct), Arthur Gaell (seal showing a crown) and Ann Gaell (seal as her husband). F.2.14*. Never listed but cited in F.2.14. Indenture Tripartite ,22 November 1679, between; (a) Arthur Gaell, John Gaell Gent, and Edward Gaell ,(b)Thomas Smith Gent and Margaret his wife , and (c) Ann Phelps Spinster ,Samuel Phelps ,Francis Boynton and Ralph Ingram. F.2.15a. Conveyance, 1 April 1662 by Elizabeth Wight Widow of Tewkesbury, ,Nathaniel Wight her son and heir, and Richard Wynne to Samuel Phelps of Southwark Merchant ,of a 12pence pa rent charge on Pypers Lynes, which had formerly belonged to Sir William Throgmorton Bt, Lord of the Manor of Rye, who had sold it to Thomas Vaughan, deceased father of the said Elizabeth Wight. Elizabeth Wight and Nathaniel Wight signed their names. Richard Wynne made his mark.Three heavy symbolic seals are appended; none have discernable detail. F.2.15aa–F.2.17b. Documents of 1699 whereby Samuel Phelps of Hackney Middlesex, Merchant. son and heir of Samuel Phelps of Basingshaw London, Merchant, conveyed Cumberwood Farm etc. to John Edgecombe of the Haugh in Tirley, Schoolmaster, and Isabella his wife, via Charles Hancock and John Brydges, both Gents of New Inn, St Clement Danes, Middlesex . F.2.15aa defines the property in great detail, with field areas and names and identifies the owners or occupants of contiguous land . F.2.15c has the personal seal of John Brydges; armorial, a shield with a bold symmetrical cross having a leopards head (apparently) facing centred on it and a small beaked bird (apparently)in the upper left quarter as viewed. 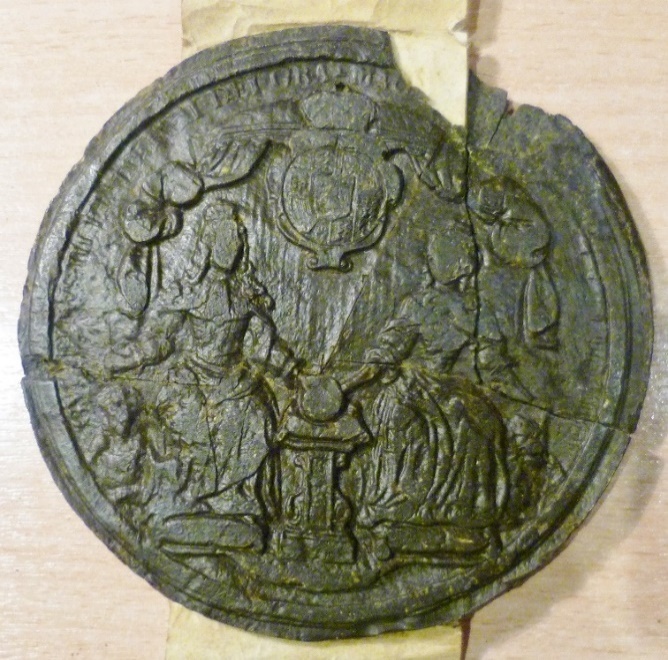 F.2.17a has a circular 11.5cm diameter royal seal in back wax, a poor impression, in two pieces although little has been lost: obverse William and Mary; reverse their arms. 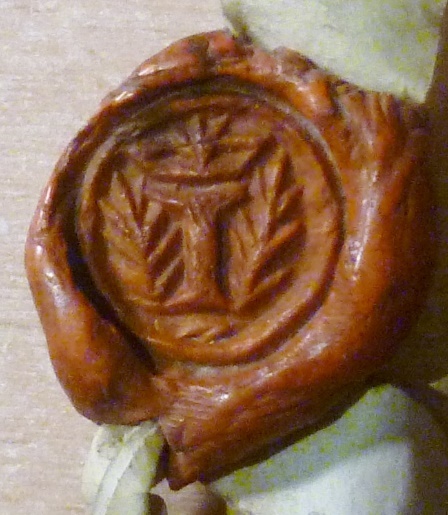 F.2.17b has the same seal incomplete and a poor impression. F.2.18a. Nominal lease of all the property purchased from Samuel Phelps, 16 July 1701, John Edgcome Gent ofTirley, to the individuals (b) in F.2.18b below . F.2.18b. Indenture Tripartite concerning the same property, 17 July 1701, between: (a),John Edgcombe Gent of Tirley; (b),Jonathan Edwards DD Principal of Jesus College, Thomas Bayley DD Principal of New Inn Hall and John Baron BD; and (c), the College. The eventual intended effect was to convey the property to the College via Trustees as endowment for Hanley School Exhibitions, subject to John Edgcombe and his wife Isabella having use of it for their natural lives, and also subject to any further arrangements made by John Edgcombe by Deed or Will. All four individual parties signed their names and sealed, but all used the same small armorial seal,the initials BB above a shield showing a cross with eight mullets of six points distributed evenly around the edge.There is no signature above the fifth seal tag, which has traces of a larger seal, perhaps the College’s. F.2.19. Void number in the 19th century list. F.2.20a–F.2.20c. Deeds of 27 and 28 August 1712 by which John Price of Harsfield, Clerk and Isabella Price his wife (relict of John Edgcombe), give up her right to the property to Trustees, leaving the remaining interests of Thomas Stanton of Hallow Worcestershire, and Mary and Margaret Slaughter Spinsters of Redmarley Worcestershire. The Trustees were now John Holland DD Warden of Merton, John Mitchell of Evesham Clerk, and Samuel Baron Clerk and Master of the Grammar School in Evesham, Jonathan Edwards and Thomas Bayley having died and John Baron now being Master of Balliol. F.2.21a-F.2.21b. Deeds of 19 and 20 May 1725 by which John Holland DD (surviving or representative Trustee ) conveyed the property to Matthew Skinner, Recorder of the City of Oxford and James Hall Gent of Oxford ( apparently new Trustees) subject to the time-limited interests of Thomas Stanton and Mary and Margaret Slaughter. F.2.22. “Mr. Phelps’ demand upon Mr. Edgcombe” according to a contemporary endorsement. A single leaf with on one side,written in the first person singular but unsigned and nd.An account of ongoing problems with the transaction of 1699. F.2.24. Notes and queries in three hands about part of Cumberwood Farm. A single leaf, nd but early 18th century. F.2.25. ALS 26 September 1820 from “High Street”, Henry Dixon (College Agent) to the Master of Balliol Richard Jenkyns) about the Cumberwood rent. F.2.26. ALS, 5 September 1836 from Tirley Vicarage, Revd J Frederick Hone to the Master of Balliol (still Richard Jenkyns), soliciting subscription to the school. F.2.27. ALS, 16 May from Tirley Vicarage, Revd J Frederick Hone to the Master of Balliol (now Robert Scott) , again soliciting a subscription to the local school.Annotated with the gist of Robert Scott’s reply, in his hand. F.2.28. “Copy of Recovery from Mr. Edgcombe 1700/1” according to a contemporary endorsement . Single leaf. F.2.29. R Davis of Lewknor ,5 November 1796, Particulars and Valuation of the College estate (annotated “Little Cumberwood Farm” in the hand of John Parsons) at Tirley and Chaceley. F.2.30. Henry Dixon, August 1817,”Particulars and Valuation of Little Cumberwood Farm ……” ,in the occupation of William Baylis. F.2.31. Agreement, 18 January 1833 Balliol College and William Baylis, for tenancy of Cumberwood. F.2.32. Extract, contemporary or nearly so , from an “Act for dividing and inclosing …. Chasely in the County of Worcester” (1795). F.2.33-F.2.35. Lists and notes concerning Cumberwood documents, in the hands of Joseph Sanford, John Davey and John Parsons. F.2.36.This is now MAP 28 . See below. F.2.37. This is now MAP 26. See below. F.3.1. Formerly F.12.3. Samuel Phelps’s account of monies received 1699/1700. F.3.3. Formerly F.11.13b. Four receipts all written on one leaf by Edward Bulstrode for monies received from John Edgcombe 1699/1700. F3.4. Formerly F.12.4. Edward Bulstrode’s account for work on John Edgcombe’s behalf 1699-1700, with his receipt dated 15 October 1700 written at the foot . F.3.5. Formerly F.11.14. ALS,Edward Bulstrode (of Clements Inn) fromTewkesbury 19 October 1700 to John Edgcombe att the Haugh. Covering note for deeds . (2) 5 ALS, 1883-1886 Julia Baylis from Cumberwood to Balliol Bursars. (4) ALS, 8 October 1893, George M Hopkins from New Hall Chaceley to Sir William Markby. His father the College’s tenant had just died. (6) Anonymous, 14 May 1902, written at the request of Castle Field and Castle, giving a favourable opinion of Tom N Hopkins, who had managed his late mother’s farm for several years. (7) ALS, 7 May 1904, RS Turner from Tirley Vicarage on behalf of the School Managers, opening Dear Sir, seeking support for creation of a playground. (1) Correspondence, estimates etc, 1904-1906, concerning building work at Little Cumberwood Farm by Charles Creese of New Pools Tirley. (2) Report on Little Cumberwood Farm following an inspection, 9 October 1905, FH Field to the Senior Bursar. (3) Report on 81 elm trees on the College estate at Chaceley. Arrangements for sale, offers, a list of timber merchants in the area etc.1906. (4) 11 ALS 1908-1916. Tom N Hopkins to Edward Hilliard, Bursar; in 1908 and 1909 he wrote from New Hall Chaceley but from 1999 his address was Wigwood Farm Tirley. (5) 3 Letters of 1910 from Worcestershire County Officials about the possibility of purchase of Little Cumberwood Farm by the County Small Holdings Committee; and an ALS from Tom N Hopkins 4 August 1910 saying he was sorry to hear of this and indicating that he might offer to purchase the Farm himself if the price was right. (6) Correspondence, estimates etc concerning building work at Little Cumberwood Farm by Coutts and Howell, Builders of Tewkesbury. Ca 1911. 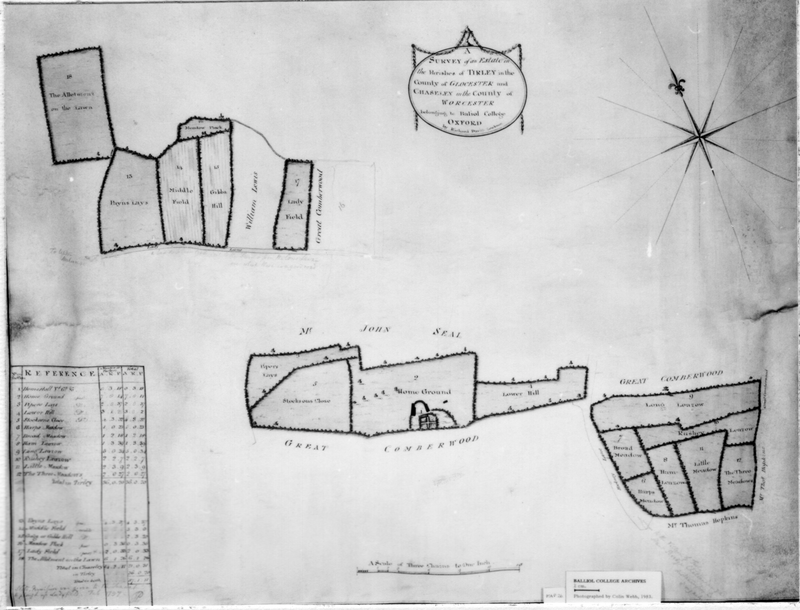 (7) Correspondence etc including a detailed plan concerning meadow drains installed at Little Cumberwood Farm, 1914. (8) Correspondence etc concerning a timber sale including elms at Little Cumberwood Farm, 1915-1916. (9) Correspondence including official notices concerning breaking up land including some at Little Cumberwood Farm for increased food production. 1918. (10) Correspondence about the Tithe Rent Charge on Little Cumberwood Farm, mentioning that the date fixed for completion of the sale to Tom N Hopkins was 25 December 1919. F.4.1. Counterpart Lease for 13 years, Balliol College to Thomas Boulton Yeoman of Tirley; lease of Cumberworth Farm etc 18 October 1769. Signed by Thomas Boulton and sealed with a small oval armorial seal showing a shield with a fess bearing five small charges between three beasts, perhaps lions statant. F.4.2. Counterpart Lease for 21 years , Balliol College to William Baylis Yeoman of Tirley; lease of Little Cumberwood Farm etc 11 January 1797. Baylis was the current occupant. Some small exchanges of land with neighbours had taken place recently as a consequence of local enclosures. F.4.4. Agreement for the erection of new farm buildings at Little Cumberwood Farm, between the College as proprietor represented by William Price of Benhall Ross, Land Agent and Surveyor, and William Baylis tenant and occupant , 25 October 1853. F.4.5. William Price, Report and accounts, 1853-1854. F.4.7. Plan and Sale Particulars of Wigwood Farm Tirley (owner Thomas Hopkins), due to be sold by auction 27 May 1863. F.4.8. ALS, CMR Chamberlain per Richard Matthews, from Ledbury 21 November 1865, to Henry Wall Bursar of Balliol concerning the planned Ross and Tewkesbury Railway, which would pass through Little Cumberwood Farm. F.4.9. Notice of a Bill for the Ross and Tewkesbury Railway. 1 December 1865. F.4.10. Francis Field of Oxford, 20 May 1863 .Valuation of Wigwood Farm Tirley for the College. It appears from this and F.4.7 that the College was thinking of buying Wigwood Farm, which was contiguous with Little Cumberwood Farm, but the Farm remained in the Hopkins family, and still in 2015 there is an R Hopkins at Wigwood farm according to the BT telephone directory. F.4.11. Jno. Fisher, November 1863, Report as to encroachment and state of Buildings at Little Cumberwood. Mr Baylis the College tenant had complained of his neighbor Mr Brotheridge’s manure heap encroaching on College property; the dwelling house was in a poor state. F.4.13. Poster advertising the sale by auction on 7 June 1882 of two lots of freehold land occupied by George White which Jeremiah Hopkins would show on application . Lot 1 was 10.O.2 acres ,bounded north and south by College property. F.4.14. Agreement, 28 November 1883, between AHD Acland Senior Bursar for the College and Julia Ann Baylis; for the tenancy of Little Cumberwood Farm @ £80pa. Originally attached is an 1887 ALS from her at Little Cumberwood to Acland asking to be released from her tenancy. F.4.15. Agreement, 10 September 1887, between AHD Acland MP Bursar for the College and John Hopkins of New Hall Chaceley; for the tenancy of Little Cumberwood Farm @ £70pa. F.4.15a. ALS, 28 September 1887, John Hopkins from New Hall Chaceley. Found unlisted interleaved with F.4.15. F.4.16. Balliol College and GM Hopkins: agreement for Little Cumberwood Farm, 1893. Missing July 1981. F.4.17. Void number in the 19th century list. F.4.18. Papers of Henry Wall Bursar relating to Little Cumberwood Farm, folded by him for filing, numbered (1) - (56), but (4) not found and one leaf without number found 2015. Concerning rents, accounts, correspondence with William Baylis Tenant, William Price local College Land Agent, various correspondence, estimates and notes of contract for works on the farm buildings etc 1847-1865. As William Price was also College Agent for Llandeilo Graban and Suckley there are occasional mentions of farms there. Of particular interest are William Price’s detailed accounts and reports of 1849-1851(3) and 1853-1854(10). F.4.19. Edward Hilliard, Senior Bursar, Balliol College November 1921, “Report on the Sale and proposed Sale of agricultural properties left by various Benefactors to Balliol College”, 12 foolscap pp, cyclostyled TS. This Report covers numerous College properties; Little Cumberwood Farm, acreage 57.3.37, had already been sold privately to the sitting tenant Tom N Hopkins for £2100. MAP 26. Listed in the 19th century as F.2.37. A coloured map with a key, about 60 x 60cm, of the College’s estate in Tirley and Chaceley, 3 chains to the inch, by Richard Davis of Lewknor, ca 1790. MAP 28. Listed in the 19th century as F.2.36. A coloured map with a key, about 50 x 100cm, of the College’s estate in Tirley and Chaceley, 3 chains to the inch by W Price, 1850. - John Jones, August 2015.